See the First Photo of Asteroid Ryugu from the Hopping MASCOT Lander! The German-French Mobile Asteroid Surface Scout (MASCOT) lander captured this photo of asteroid Ryugu during landing operations on Oct. 3, 2018. The lander's shadow is visible at upper right. 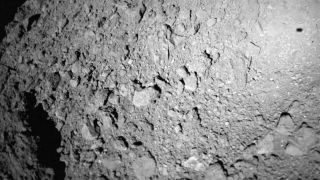 A small European probe about the size of a shoebox successfully landed on the asteroid Ryugu overnight last night, and its first photo is a doozy: a shadow "selfie" showing the space rock just before the landing. The photo, released today (Oct. 3), was captured by the Mobile Asteroid Surface Scout, or MASCOT, which landed on Ryugu after being released from its Japanese mothership, Hayabusa2, from a height of just 167 feet (51 meters). It took 20 minutes for the lander to reach the surface of Ryugu, with MASCOT's first photo revealing a rocky, pitted terrain and even the probe's boxy shadow in the image's upper right corner. Asteroid Ryugu was about 186 million miles (300 million kilometers) from Earth at the time, said officials with the German Aerospace Center (DLR), which built MASCOT. Jaumann is the scientific director for MASCOT's camera "MASCAM," which snapped 20 photos of Ryugu during the probe's short descent to the asteroid's surface. MASCOT's battery should last about 16 hours after the landing, DLR officials have said. The MASCAM camera isn't the only instrument aboard MASCOT. The 22-lb. (10 kilograms) lander carries four instruments in all: MASCAM, a radiometer also built by DLR, a magnetometer built by the Technical University of Braunschweig and an infrared spectrometer from the French space agency, CNES. The lander can hop using a swinging arm inside its body. MASCOT's magnetometer is already beaming home data on the conditions near Ryugu. "The measurements show the relatively weak field of the solar wind and the very strong magnetic disturbances caused by the spacecraft," Karl-Heinz Glaßmeier of the Technical University of Braunschweig said in the same DLR statement. "At the moment of the separation, we expected a clear decrease of the interference field — and we were able to recognise this clearly." Japan's Hayabusa2 spacecraft successfully dropped the MASCOT lander on the asteroid Ryugu on Oct. 3, 2018 (Japan Standard Time). Left: Illustration of the MASCOT lander separating from the Hayabusa2 mothership. Right: Illustration of MASCOT landing on the surface of the asteroid Ryugu. MASCOT is a joint project by DLR and CNES and is the third lander to touch down on asteroid Ryugu in recent weeks. It follows on the heels of two small, hopping Japanese rovers, called MINERVA-II1A and MINERVA-II1B, which touched down on Ryugu in late September. Another MINERVA lander and an impactor probe will be released in 2019, according to the Japan Aerospace Exploration Agency, which is overseeing the Hayabusa2 mission. "With MASCOT, we have the unique opportunity to study the solar system's most primordial material directly on an asteroid," Jaumann said. In addition to deploying the landers, JAXA's $150 million Hayabusa2 spacecraft is designed to study asteroid Ryugu in unprecedented detail. The spacecraft will also collect samples of the asteroid and return them to Earth in December of 2020. JAXA launched the Hayabusa2 mission in 2014. Later this year, the U.S. spacecraft OSIRIS-Rex is scheduled to make its own rendezvous with the near-Earth asteroid Bennu for NASA. That spacecraft is due to arrive at Bennu on Dec. 31 and collect samples to be returned to Earth in 2023.